Who is Anne? Is she a terrorist? A good daughter? Is she a car? A tree? Do we remember her or are we inventing her? Alex Lazaridis Ferguson is an award-winning director and actor. Co-Artistic Director of the internationally acclaimed performance group Fight With a Stick. Please note that our Saturday performances include faculty talks that will enhance audience member’s understanding of the performance. Reserve your seats online at ufv.ca/plays. 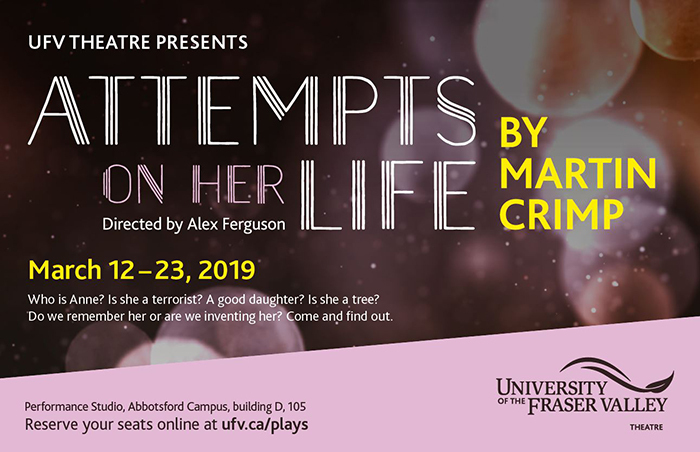 For more information contact, theatre@ufv.ca or phone 604-795-2814.